Talent always shows itself – even when it hides for long years -, it comes to light sooner or later. Real talent comes like a comet in the course of time to make it even brighter – and, of course, when it is needed, the world goes to the talented person. Exactly this happened to a young British gentleman called Sidney Edward Paget. The world of paintings and drawings was not new for him, because his brothers, Henry Marriott Paget and Walter Paget were illustrators and Sidney himself studied art as well. He longed for showing what he can do. When the postman delivered a letter in which „Mr. Paget” was commissioned for making illustrations for Conan Doyle’s Sherlock Holmes, he ardently began to work. He made lots of sketches and brought a massive demo to the publisher. Astonishingly they wanted to hire his brother, Walter for the job. There are several explanations why the first name had been left out from the envelope – some think it was the failure of a drunken or a simply sloppy staff member. In fact, it is not so important at all – with that letter the world went to the genius. Sidney’s drawings were beautiful, and the publisher thought they found the artist they needed. The dubious commission gave a fantastic artist to the world. Sherlock Holmes is the symbol of hope, and this story with the letter gives hope to those fans of his, who think their abilities are not yet fully evolved. For them Sidney Paget is a role model. The world does go to the talented people. Walter had no reason to be sad at all. Sidney supposedly modelled Holmes after him, and people soon began to call him Sherlock Holmes. Later he also had the opportunity to draw the sleuth. Though Henry Marriott Paget told Sidney did not use models for his drawings, so he did not created Holmes to look like Walter. Some people think Henry told this because for Walter it was very uneasy that he had been identified with Doyle’s character. It is also said that without a model Sidney could not have been able to make so many illustrations in such a short time. But we must not forget that Sidney was an outstandingly talented and productive artist. The proof of that is that during the years he made more than five hundred Holmes illustrations, while he had other commissions too. (Unfortunately many of his black-and white drawings perished and only 356 of them were published in printed form.) Whether Sidney used his brother as a model or not, he is undoubtedly a stunning illustrator. „ Inspector Gregory, to whom the case has been committed, is an extremely competent officer. Were he but gifted with imagination he might rise to great heights in his profession. ” – told Sherlock Holmes about his colleague when he investigated the case of the missing thoroughbred, Silver Blaze. The famous horse disappeared and Holmes was the only who could find him. „ See the value of imagination. ” – he declared to Watson. He is the greatest detective in history, because he relies not only on rules that can be learned, but on his own imagination as well. Sherlock does not work by patterns, as an artisan, he is a creative artist who uses his genius as a source of inspiration. His creator, Arthur Conan Doyle did the same. He was a fantastic writer, who could create breathtakingly realistic characters and thrilling stories. He was a master of applying the rules of literature and he was brave enough to get inspiration from the works of Edgar Allan Poe. But he was not a mere mimic – he enriched his sources with elements from his own imagination. With the adventures of Sherlock Holmes he created a singularly new object of art. We, the fans of Sherlock Holmes think that the detective has two fathers: Conan Doyle, who created his stories, and Sidney Paget, who drew these. Both were brilliant, versatile and productive artists, who became world famous because of Sherlock Holmes. It is well-known that the writer was not completely satisfied with the illustrations of Paget. Of course he saw that the pictures are wonderful, but he stated that for his taste Sidney’s sleuth is too handsome. Love is very important to understand why Sidney departed from the concepts of Doyle when he drew the character of Holmes. He did not want to show off with his ability of making great illustrations with handsome people, but he read the novels, became familiar with the characteristics of Sherlock and he really came to like the detective. What is more, he turned into a fan of his, exactly like Frederic Dorr Steele. (You can read about him here: Frederic Dorr Steele) Love is the explanation of why Sidney saw Holmes as an angel. „ Art’s vocation is to unveil the truth in the form of sensuous artistic configuration, to set forth the reconciled opposition just mentioned [the common world of earthly temporality, and a realm of thought and freedom], and so to have its end and aim in itself, in this very setting forth and unveiling. ” – stated German philosopher G. W. F. Hegel. The illustrator of The Strand Magazine marvellously showed with his pictures what moved his heart. And he impressed the whole world. Doyle definitely respected the artistic abilities of Paget. Soon it was evident for him that it is talent and love that urges Sidney to find new ways. Holmes and his era often were the subjects of parodies, even in illustrations. But Sidney never made illustrations that would dishonour either Sherlock or Doyle. The changes he made supplemented the world of the great detective, bringing in new colours. No doubt that Sidney’s talent, his love of art soon persuaded Doyle. The two men became friends. The writer gave a silver cigarette-case for Paget as a gift at his wedding, with the engraving „ From Sherlock Holmes, 1895 ”. Four years later Sidney gave a portrait painted in oil to the writer with the hatch of the Doyle family appearing on it. The painting became a widely known portrait of the artist. As a reward for having imagination Sherlock Holmes finds Silver Blaze and solves many other mysteries. 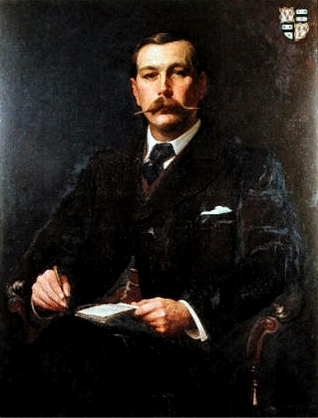 Conan Doyle’s bonus was wealth and reputation, while Sidney had the benefit of popularity. Sidney was the last to join Doyle and Holmes, and sadly he was the first to leave our world. He died at the age of 47, after long suffering. Him, Doyle and Holmes have at least two things in common: respect for their profession and immortality. The Sherlockian world will never forget that the character of Holmes was created by Conan Doyle, but there was another man who „adopted” him and made him alive with lots of fatherly love on his illustrations – and this man was the fantastic Sidney Paget.
" 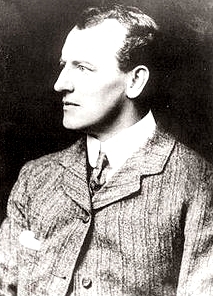 Sidney Paget the Sherlock Holmes illustrator"